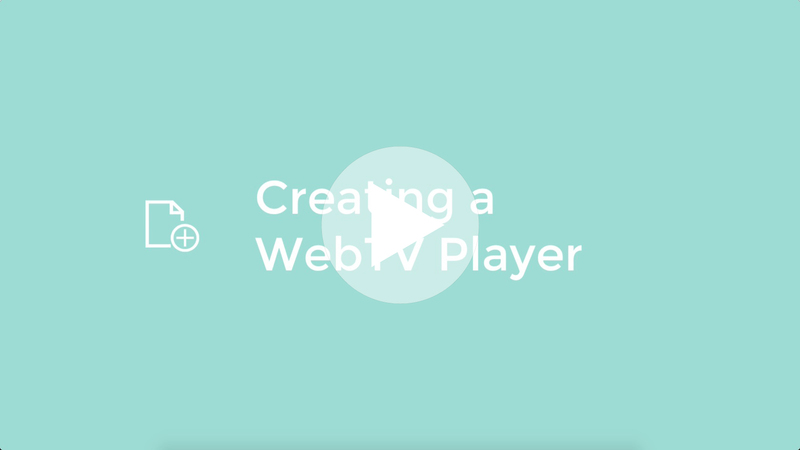 Create a WebTV Player that lets you schedule an On Demand Media Playlist to playback like a traditional TV Channel. You can even set specific start dates and times as well as choosing if you want the scheduled content to loop or simply terminate at the end of playback. You can checkout a demo as well as get more information on our WebTV information page. To create a WebTV Player you will need to click on the All Media button in the left hand navigation bar. Now select the Web TV tab. Here you can enter a Title to identify your Web TV Player in future. WebTV Source Playlist; Here you can choose which of your on-demand video Playlist you would like to load as a pre-scheduled TV Channel. Start Date / Time: Here you can enter what date and time you would like the channel to start playing your videos in a sequence. Loop WebTV Stream when finished; If you enable the loop function your channel will start playing the videos within the playlist from the start as soon as it finishes. Destination; Here you can choose if you wish to add the newly created Web TV Player to the Default Playlist which is the where any videos that are not part of a specific playlist will be located. Or if you wish to add the Web TV Player to a specific playlist. Now simply click on the green Save button to create the Web TV Channel. You can make future changes to your WebTV Player in the media panel. Then click on the Web TV tab within the settings panel. Here you will see all your current settings for your Web TV Player and are able to make any changes desired.